Right now my computer monitor rests on three books written by Gary Gygax, the co-creator of Dungeons & Dragons and nerd deity of the highest order, who died this morning. I'm sorry, Gary, to be using your books to lift my tube, but I want them right here, where I can see them. It's not that I'm a big RPG freak, as I was never more than a casual player of the stuff. I actually kind of sucked at it. These books are personally nostalgic, on one level, things I would read with no one around, with no game anywhere in sight. But they're also artifacts from a short era in pop culture, when games were played almost entirely in the imagination. 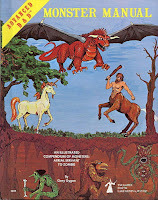 DUNGEON MASTERS GUIDE and MONSTER MANUAL gave us some structure (which could be taken to the extreme), but most of what happened on those quests, back in the day, was your own. I interviewed Gygax over the phone a few years ago, for Entertainment Weekly, and remember feeling guilty for taking so much of his time for what I knew was, like, 100 words at the back of the magazine. He spoke so deeply about the mechanics behind role playing, and the connections between players, that I didn't want our chat to end. Anyway, the man passed today, and it's big deal. I wrote something on E! Online. Something small. And if you're looking for something freakier, video tributes started popping up on YouTube in the last hour. The guy wearing the hood? That's not me. UPDATED: Thank you, New York Times. A thoughtful, worthy obit.